After spending all winter planning for an adventure into the Olympic National Park. I set off from my winter quarters, a little farm outside Port Angeles, Washington on foot. Walking a mile to the bus stop, just after sunrise to start my journey. It is a unique feeling to walk away from your winter quarters to the unknown for the next three months. I would have the basic template of my route ahead, broken down into sections, but would have an extra four weeks of unplanned time that I could just 'wing it' based on the current snowmelt of certain areas in the Olympic National Park. 'Momma Pig', a heritage breed - free range animal here on the farm. She wasn't impressed that I was leaving into the wilderness. In preparation for this trip I didn't do much as far as stockpiling food or other things, such as stove fuel and hygiene items. After doing something similar last year, I found it less stressful to just focus what was needed one section at a time, hitch out of various trailheads and resupply for the next walk. This way I could do real-time menu changes and adjust stove fuel sources based on conditions in the weather forecast. Forks, Amanda Park, Sequim and Port Angeles offer the easiest resupply. All these towns have everything I would need to continue the next leg of the journey - grocery, outdoor specific items, restaurants (caloric replenishment), free Wifi and full public transportation services. Having everything I already needed from living an outdoor lifestyle, I did not purchase additional gear for this summer adventure. I’m not big on carrying a bunch of individual items, it’s just more you have to take out and put away. Making the daily tasks simple as possible. Focusing on what matters, walking in wilderness. Not having a heavy burden of pack weight to hinder that experience.The heaviest thing carried would always be food, which ranged from 3 to 10 days without resupply. The biggest thing I wanted to focus on was experiencing the Olympic Mountains during every season of the year. Also to walk in every micro environment the Park has to offer. A lot of my routes included several of these in one trip, so that I could see and feel the changes unfold under my feet. Starting during mid-spring melt, I could witness all the various wildflowers through their annual life cycle. I found that they can detect what type of winter we would have in store for us during the following season, just by keeping an eye on what nature tells us. Wildlife habits are also a perfect indication of this. The animals know and can instinctually detect weather. Mating and migration habits reflect this as well. North Olympic Coast - for this section I would be walking on the Washington coast from Neah Bay to La Push, Washington. This took several talk, because a person call only hike at low tide around certain points of the landscape. The Hoh Rain Forest - for the second section, I would be walking to Mount Olympus. Then after a few days of exploring, I would hike up and over the High Divide, and exit the Sol Duck for food. Mount Angeles near Hurricane Ridge - for the third stage, I would be spending some time near Port Angeles, trying to photograph Mountain Goats. This would give the body some rest, after the physical demand of the previous section. Sleeping with Marmots Loop - for the fourth section, I would be doing a spring almost loop hike. This would include on trail, snow and cross-country walking. Every campsite choice included sleeping with wildlife. Backpacking Across the ONP Route - for the fifth section, I walked with some friends across the Olympic Mountains. We started at the north and ended the trip in the south. Hiking into Trouble - for the sixth section, I was attempting a 10 day solo off trail hike. During day 4, I slipt in the mountains, in result of bad decisions, I got myself rescued. Humbled by the Mountains - After a few weeks out of the backcountry to recover. I set off on trail once again, for the seventh section. For this hike, I would visit to where near I got rescued and pay my respects to the mountain. 7 Day Backpacking Loop Trek - for the eight section, I would be joined by some friends from all over the country. We would do a loop hiking, which lead us on and off the trail. Bailey Range Traverse - for the ninth section, I would be join by two friends, where we walked off trail across the Olympic National Park in 10 days. Pacific Northwest Trail Section to Coast - for the tenth and finial section, I would walk solo from the mountains, to the Pacific Ocean once again. 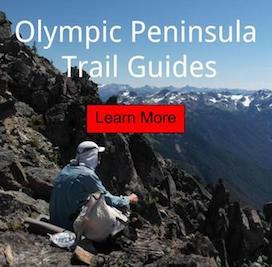 This would conclude my multi-month adventure on the Olympic Peninsula.